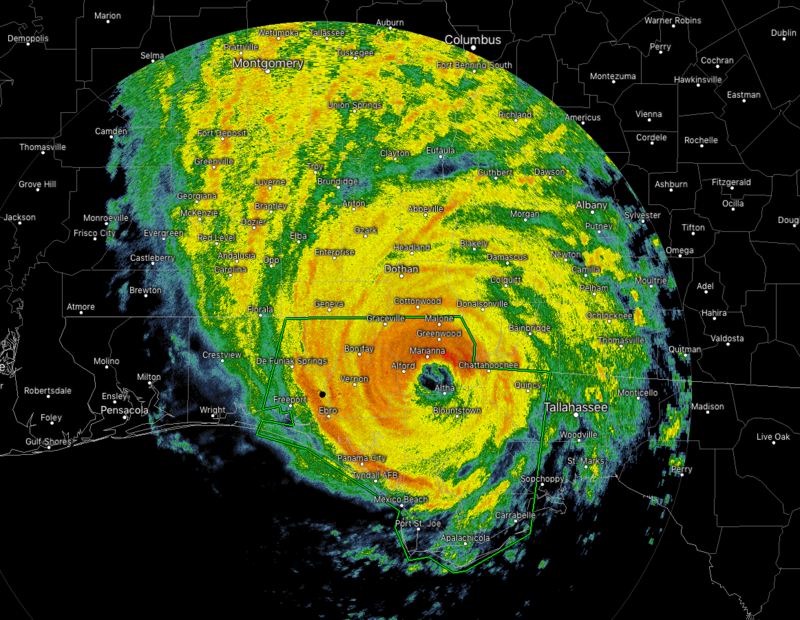 The eye of Hurricane Michael is currently located just to the west of Altha, Florida, and will be crossing I-10 within the next several minutes. The latest statement from the National Hurricane Center has the maximum sustained winds down slightly to 140 MPH, which is only 15 MPH less from what they were at landfall. The minimum central pressure has risen back up to 927 mb. Movement continues to pick up in forward speed, now up to 15 MPH as it continue to head to the north-northeast. 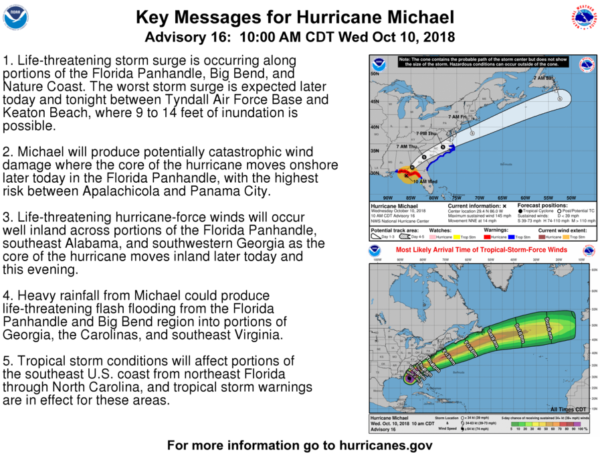 The Storm Prediction Center has an Enhanced Risk for severe storms for much of the southeastern United States mainly for the effects from Hurricane Michael. There is the possibility for tornadoes across the parts of the Florida Panhandle up into the the southern half of Georgia and into the southern parts of South Carolina. Dangerous storm surge continues along the coast of the Florida Panhandle. A National Ocean Service water level station at Apalachicola is still reporting over 7 feet of inundation above ground level. 4. 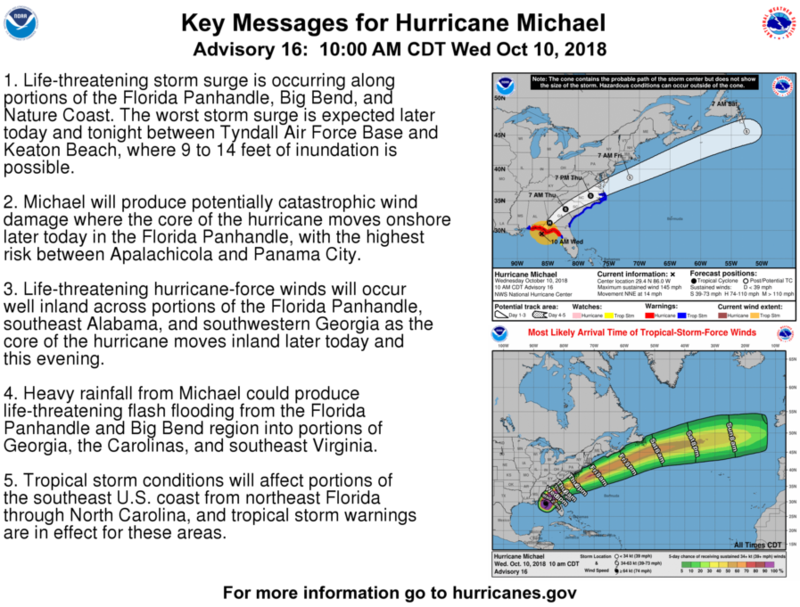 Heavy rainfall from Michael could produce life-threatening flash flooding from the Florida Panhandle and Big Bend region into portions of Georgia, the Carolinas, and southeast Virginia. 5. Tropical storm conditions will affect portions of the southeast U.S. coast from northeast Florida through North Carolina, and tropical storm warnings are in effect for these areas.